A look at the stack and tools Netflix uses and how their culture influences how their service scales. Denys Mishunov looks at how time isn’t just about accurate figures but about how the end user perceives time and what we can do to influence it. Similar to the Amazon AWS Status Page or the Google Apps Status Page. Stashboard was originally written by Twilio to provide status information on its Voice and SMS APIs. Are you still managing your own monitoring system? Really? Tired of trying to fight with your monitoring system to get answers from your servers and apps? We've built a better version. Automated dashboards from AWS Cloudwatch, beautiful Grafana dashboards and granular team features. There's a better way! 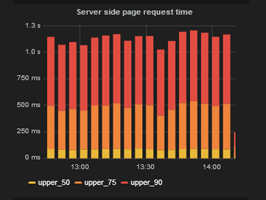 Big Rig helps you analyse the trace data produced while loading a Web page. First in a series of posts looking at how to monitor the popular high performance TCP and HTTP proxy. A high level keynote about the organizational impacts of moving to a microservices-based architecture. So far Amazon’s EU datacenters have been in Ireland and Germany, but the UK and South Korea are forthcoming. Looking for job offers from top companies but hate applying? You're in luck! Through Hired, companies reach out to candidates with your skills and experience and request interviews. Stop applying and let the offers come to you with Hired. Findings that indicate containers are more energy efficient than VMs. Just slides, but they’re pretty detailed.